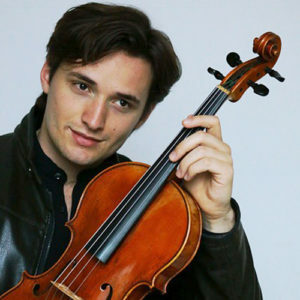 Mathis Rochat was born in Geneva in 1994 and began his musical studies on the violin, eventually switching to the viola at age 13. He pursued further studies with Antoine Tamestit at the Cologne University of Music, and currently studies with Tatjana Masurenko at the Felix Mendelssohn Bartholdy Hochschule für Musik und Theater Leipzig. As a soloist, Mr. Rochat has performed the Walton Viola Concerto with the Norddeutsche-Philharmonie Rostock, the Hoffmeister Viola Concerto with the Ensemble Da Capo, and the Mozart Sinfonia Concertante with David Castro-Balbi. As a chamber musician, he has collaborated with artists such as Alasdair Beatson, Amaury Coeytaux, Yan Levionnois, Manuel Vioque-Judde, and Thomas Reif. He has also shared the stage with Gidon Kremer, Antje Weithaas and Christian Tetzlaff as part of a spring program at the Kronberg Academy. Mr. Rochat has participated in master classes with Tabea Zimmermann, Nobuko Imai, Hartmuth Rode, Thomas Riebl, Lars Anders Tomter, and the Auryn and Vogler String Quartets. He is a laureate of both the 2014 Cecil Aronowitz international Competition Birmingham and 2015 Beethoven International Competition. Mr. Rochat is presently a fellow of the Villa Musica Rheinland-Pfalz Foundation.